This sample was created in ConceptDraw DIAGRAM diagramming and vector drawing software using the Pie Charts Solution from Graphs and Charts area of ConceptDraw Solution Park. 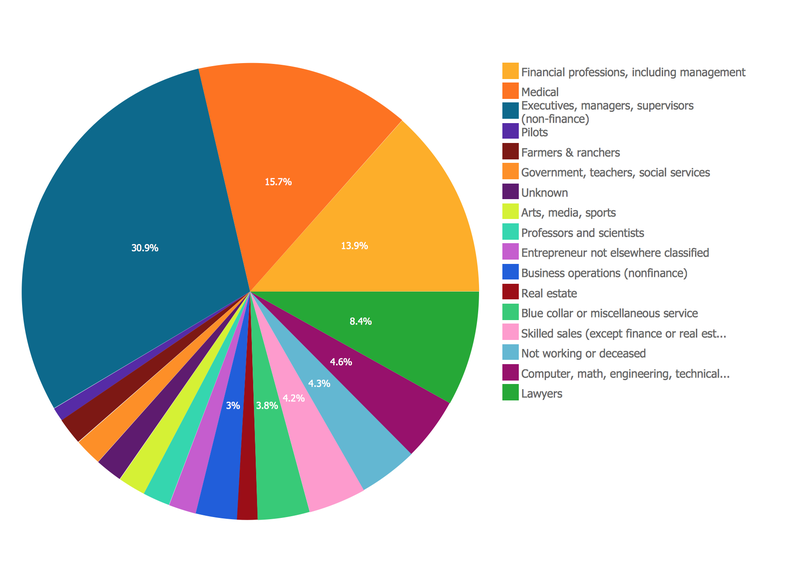 This sample shows the Business Report Pie Chart. The Pie Chart visualizes the data as the proportional parts of a whole, illustrates the numerical proportion. Pie Charts are very useful in the business, statistics, analytics, mass media. Example 1. Business Report Pie. Using the ready-to-use predesigned objects from the Pie Charts Solution for ConceptDraw DIAGRAM you can create your own professional looking Pie Chart Diagrams quick and easy. The Pie Charts produced with ConceptDraw DIAGRAM are vector graphic documents and are available for reviewing, modifying, and converting to a variety of formats (image, HTML, PDF file, MS PowerPoint Presentation, Adobe Flash or MS Visio). Creating of professional looking Information Graphics was always been a complex process. But now it's easier than ever thanks to the ConceptDraw DIAGRAM v12 diagramming and vector drawing software extended with Pictorial Infographics Solution from the “What are Infographics” Area. Pie Graph is very popular kind of charts which is widely used in various fields of science and life activities. ConceptDraw DIAGRAM v12 extended with Pie Charts Solution from the Graphs and Charts area is the best software for drawing the Pie Graph Worksheets.